Today was a good day because I got to rock my new combat boots for the first time, I’ll get to them in a minute. Today I wore a simple white tee and a cozy marled cardigan by Element. I love the oversized shawl collar and the asymmetrical button closures. 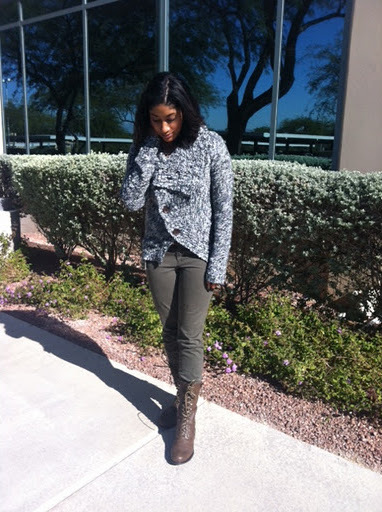 I also wore military-green skinnies that I got for a whopping $7.99 from Old Navy and my precious new boots. 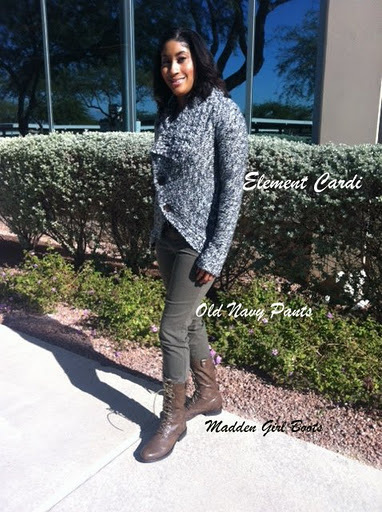 The boots are by Madden Girl and the style name is Zorrba. 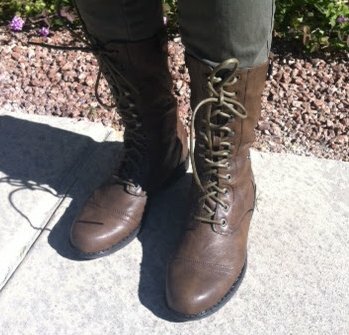 The front of the boots have a cool lace-up design and the back zip down so you don’t have to hassle with the laces every time you put them on and take them off. I love the cool pink contrast at the zipper and that they are a feminine take on the combat boot, so they are slim instead of clunky. If that’s not cool enough, the shaft can be folded down and secured by snaps to reveal the plaid, pink and brown, interior. As Cher in Clueless would say, I have to give myself snaps for making this purchase. I have to thank my friend Krystyn for convincing me to take advantage of the BOGO sale at Rackroom Shoes. 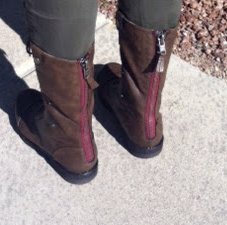 Those are the cutest combat boots, I love the pink zipper in back. Love them! Want a pair of my own.